This years NBA Draft was an fantastic event as always, as fans and players came together on June 28th at the WaMu Theater at Madison Square Garden in New York City. MB Productions (MBP) was on hand to provide video support for the event, which is all completely live. 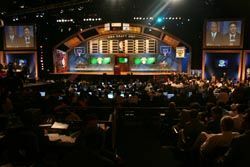 MB Productions provided video support for the 2007 NBA Draft, held at the WaMU Theater at Madison Square Garden in New York City. Brian Brooks, president of MBP, explained the company's role in the event. "The NBA, one of our long time clients, wanted a couple things from us. One was to put together a live show for the audience attending, which included the players, their families, and the fans. So the projection screens were primarily for the live show. Not only did we feed what came off the NBA's production truck, through the screens, but we also intercut Beta SP clips. So we were always in show mode, because the network broke away for commercial breaks. The second thing they wanted was support for the actual broadcast show, which was the plasma monitor that was over the shoulder of the commissioner. This showed the animated, high-resolution loops of the team that was doing the picking at that given time." MBP supplied a pair of 9 X 12 foot FP projection screens that were powered by Digital Projection 5100gv DLP projectors, as well as several Pioneer 60 and 61 inch plasmas monitors. These were all fed content via a Folsom Screen Pro Plus 1603. According to MBP's technical director, Joseph Meyers, "The Folsom let us control (3) separate program outputs off the same control desk. With it's ability to save a multitude of presets, I was able to pull up different show looks with the push of one button." All animations were stored and played back off a pair of Grass Valley Turbo Hard Drives. "With its ease of use and ability to alter the predetermined play list on the fly made it an ideal playback device," said MBP's engineer, Bob Woodcock. "At any moment during the player selection process, a team could announce a trade that would result in our need to instantly access a different animation loop. With its dual playback channels per Turbo hard drive, we could also have a back-up channel to go to." logos, and a Pioneer 61 inch that was installed upstage center displayed high resolution animations of all of the participating NBA teams. For more information visit www.mbvideo.com.